How about Georgia Tech's LMRC, which has three different ranking approaches. There's another one with a guy's name that I'm blanking on. 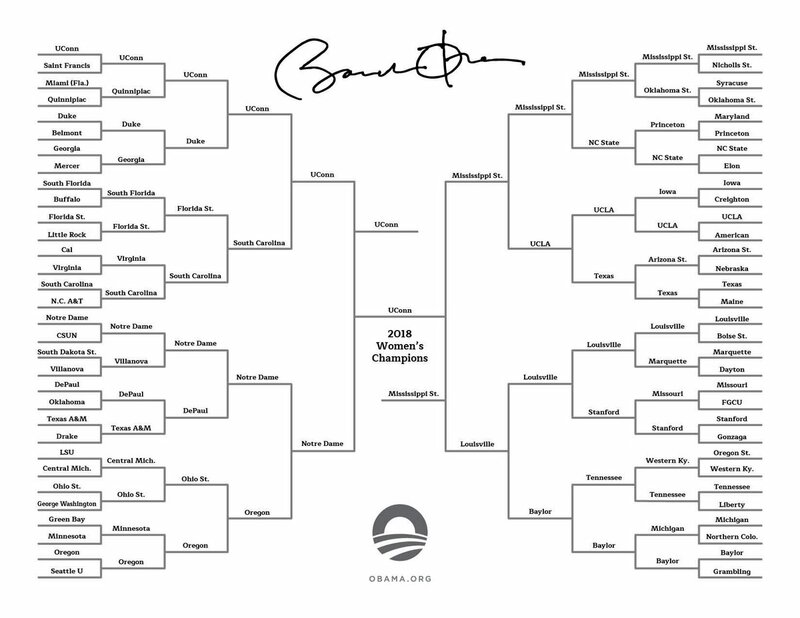 All Obama has to do is get Minnesota over Green Bay right, and he's the G.O.A.T. in my book. Massey, College Sports Madness, LRMC, Hero Sports, SporTheory, KPI, RPI, and the Polls are at 250. The Coaches Poll is down a S16. RPI and the Coaches Poll are at 390. The Poll is down a S16 tomorrow. Her Hoop Stats is at 500. It is down one E8 team. Massey, SporTheory, and KPI are at 450. KPI is down one E8 team. Real Time RPI is at 410. It is down one E8 team. Massey, SporTheory, and KPI are at 530. KPI is down one E8 team. Massey and SporTheory are down a finalist. KPI is down one E8 team tomorrow. All 17 entries have UConn winning it all and Miss St in the F4. All the ones missing a finalist had Baylor there. KPI, College Sports Madness, and D-I Sports Net are at 810. CSM and D-IS are down a finalist. All entries have UConn winning it all. All except RPI, KPI, and Real Time RPI had Baylor in the final. RPI and KPI have Louisville, Real Time RPI has Miss St. So, if Louisville beats Miss St, RPI will win. If Miss St beats Louisville Real Time RPI will win. I don't know how points are awarded. Do you get more points for a game in later round? I mean, it seems that RPI is way ahead of Real Time, yet Real Time can leapfrog RPI simply on the outcome of a game between the second and third #1 seeds. Later round games are worth more points. First round 10 points, second round 20, S16 40, E8 80, F4 160, final 320.